In the Renaissance the Unicorn was considered a symbol of purity and grace. Legends spoke of the Unicorns horn as a source of fertility. Thus it was hunted. In one of his notebooks Leonardo da Vinci wrote: “The unicorn, through its intemperance and not knowing how to control itself, for the love it bears to fair maidens forgets its ferocity and wildness; and laying aside all fear it will go up to a seated damsel and go to sleep in her lap, and thus the hunters take it”. In modern interpretations the Unicorn is considered the embodiment of all that’s good in the world. With it’s death comes darkness and a reign of evil. That’s the narrative I’ve tried to convey in this image. We stand before the tomb of the last Unicorn. 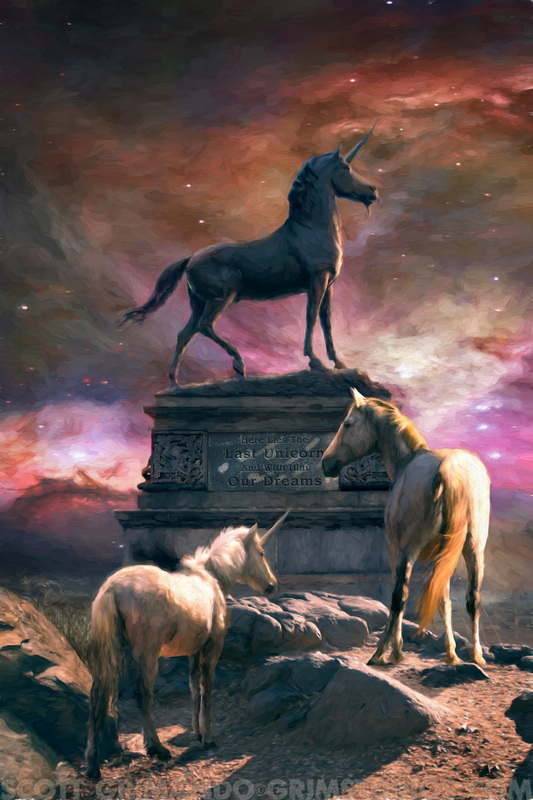 On it is inscribed; Here Lies The Last Unicorn And With Him Our Dreams. The sky is on fire as chaos loams in the distance. In the foreground we see a white horse with her half-breed son. Hope is reborn and the cycle is complete.